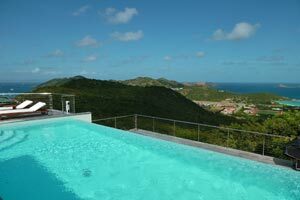 Villa UJV 353 is a contemporary 4 bedroom villa ideally situated in Lurin, St Barts just minutes away from Gustavia. The breezes and views over St Jean add to villa UJV 353's attraction. While nothing is excessive in this villa, attention was paid to the details. Bamboo stalks, artwork, the use of wood and pebbles, all contribute to creating a refined living space, and a instill a sense of peace throughout the property. Villa UJV 353 has a spacious, open living area with plenty of seating and, connects to the open modern kitchen, which comes fully-equipped. From the kitchen one can look out on the living area and also the pool, and expansive view beyond. A large master bedroom is just a few steps up from the kitchen. Its large dressing area leads to a beautiful bathroom with shower. The second bedroom is on the other side of the villa. In the ensuire bathroom is an exterior shower. The 3rd and 4th bedrooms are located on a lower level, down a flight of stairs. The third bedroom has 2 twin beds that can be made up as a king. The fourth bedroom has a king sized bed. Both have the same amenities. The large infinity pool complements the panoramic views. A gas grill is located on separate deck just below the pool. Villa UJV 353 is ideal for couples, or couples with children.